Vedatrak Full Pack is a new amazing deal from SUI Solutions. This package includes all Vedatrak modules and features. Vedatrak Full Pack is a new amazing offer from SUI Solutions. This package includes all Vedatrak modules and features. Don’t spend your time for searching and analyzing — just buy all at once with a Great discount. Save almost $400 with Vedatrak Full Pack. Mail Module carries out all work with correspondence. Each e-mail is associated with a task, contact or document. Each user can filter correspondence by task or contact and group messages by topic. 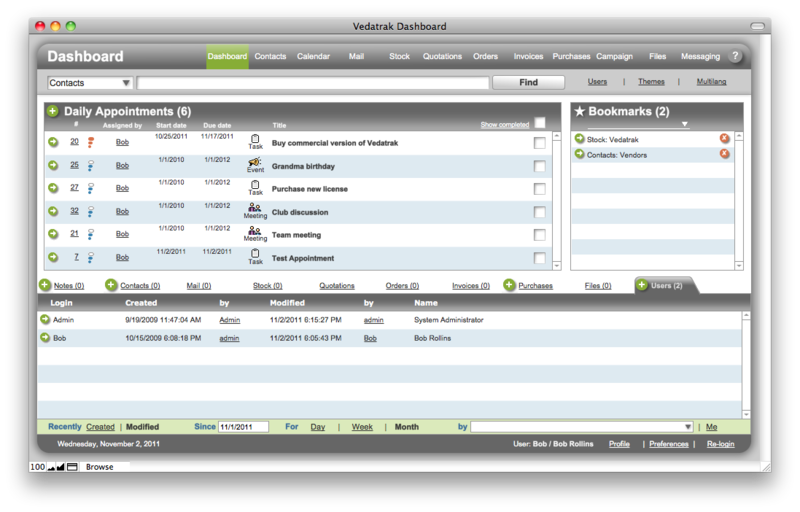 Vedatrak supports the sales process by tracking order, quote and purchase history, costs, payments and simplifying invoicing. Invoices can be created directly from any order. All associated sales documents for an order can be easily accessed from any single document, including payments and invoices. The Stock module provides a centralized resource to organize your company's products using different categories. Track stock quantity for each product using Purchases Orders and Sales Orders. Vedatrak Campaign module supports the sales process by tracking promotional campaigns assigned to different prospects and customers groups. * If you already purchased Vedatrak Base pack 2.1 and want to upgrade to Vedatrak Full Pack 3.1, you will be offered a special upgrade price. System will automatically check Your Downloads and define if you're performing an upgrade. Purchasing a support package in conjunction with Vedatrak Full Pack will enable you to rest assured that all technical aspects of using our product will be handled so you are free to provide you or your team with the professional support to effectively use it.